Make an Inference Reading between the lines. 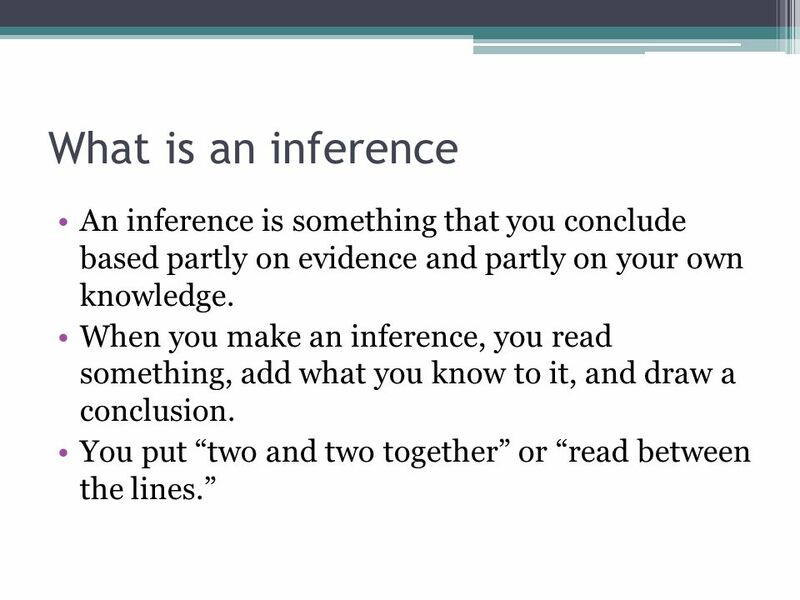 What is an inference An inference is something that you conclude based partly on evidence and partly on your. 2 What is an inference An inference is something that you conclude based partly on evidence and partly on your own knowledge. When you make an inference, you read something, add what you know to it, and draw a conclusion. You put two and two together or read between the lines. 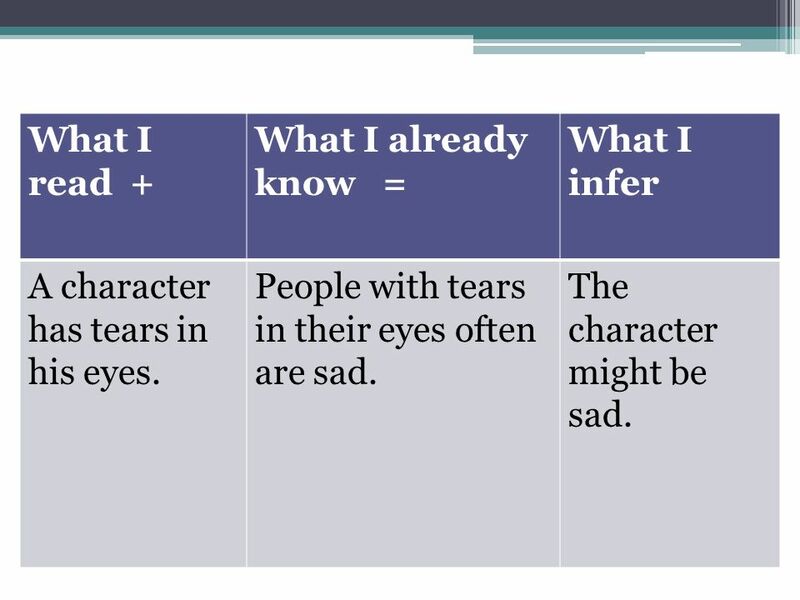 3 How to make an inference What I read + What I already know = What I infer A character has tears in his eyes. People with tears in their eyes often are sad. The character might be sad. 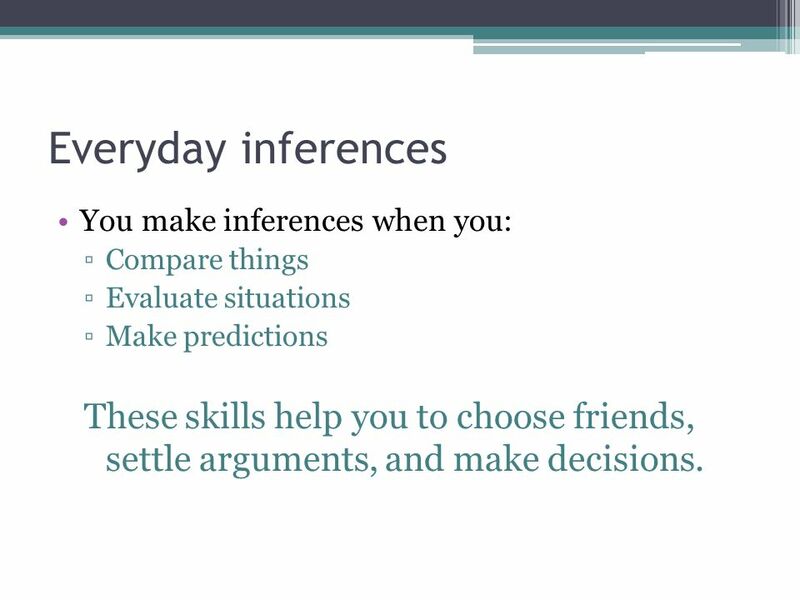 4 Everyday inferences You make inferences when you: Compare things Evaluate situations Make predictions These skills help you to choose friends, settle arguments, and make decisions. 6 Example TextHow does this girl feel? The house stood at the top of the hill surrounded by twisted, bare trees. The girl shivered in the cold wind and brushed the wet snow from her boots. She remembered her nice, warm home in Florida with its sandy beaches and bright sunshine. Slowly, she walked toward her new home. What I read + What I already know = What I infer 1.The setting creates a dreary, sad, unwanted mood. 2.The girl thinks of her old home. 3.The girl walked slowly to her new home 1.Its hard to move to a new place. 2.When you move, you lose things you care about or are used to. 1. The girl does not like her new home and prefers her old home. 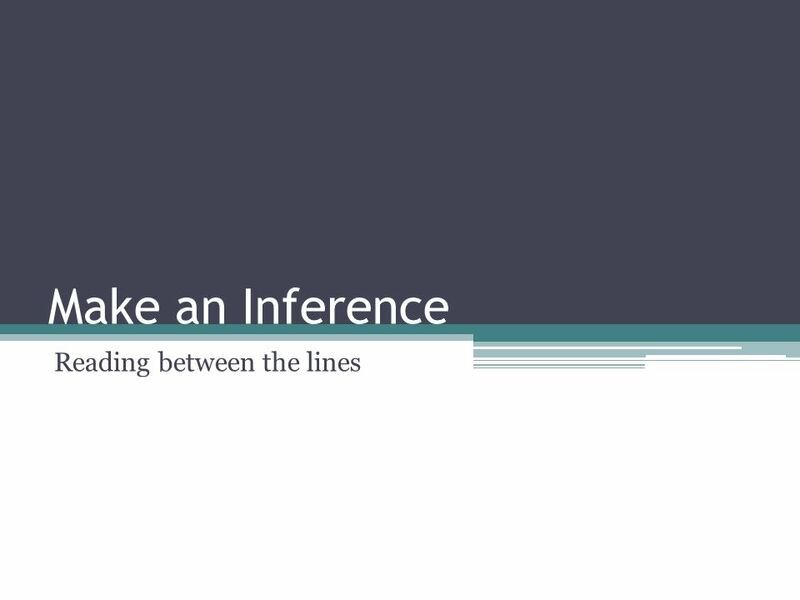 Download ppt "Make an Inference Reading between the lines. What is an inference An inference is something that you conclude based partly on evidence and partly on your." Narrative Writing What is Narrative Writing? Narrative writing tells a story. Narrative writing can be true and about real people and real events. Narrative. Make an Inference Read Between the Lines. 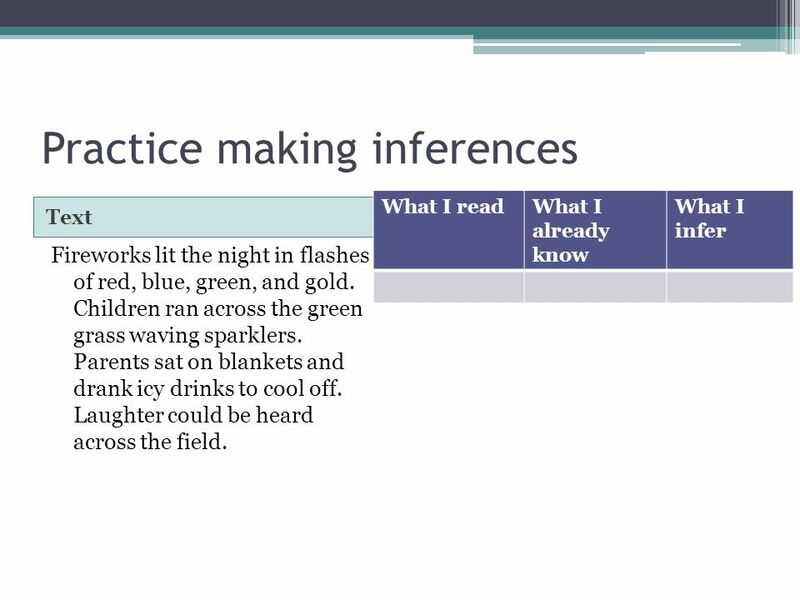 What is an inference? An inference is something that you conclude based partly on evidence and partly on your. The color of the sun. Five hundred products Plan your day. The color of the sun. Answer my questions. I knew that dog. Miss Brown Room 118 CLASSROOM OBSERVATION QUIZ _________________ READING STRATEGIES & INFERENCE MAKING. Analyze Scenes: Movie ‘Up’ 7:20~9:48. The reason for why I choose this movie scenes: -I wanted to study about how to make my family shows really close. W.5.3 Write narratives to develop real or imagined experiences or events using effective technique, descriptive details, and clear event sequences. By.  A comparison of two things using the word like or as  Ex: Her cheeks were as red as a rose  He was fierce like a lion. Making an Inference: Character Feelings. Making an Inference Readers often have to guess about an author’s meaning. Good writers don’t tell us everything. “ Blast Off !”. fondly When something is done fondly, it is done in a caring, loving or tender way. Reading Between the Lines. 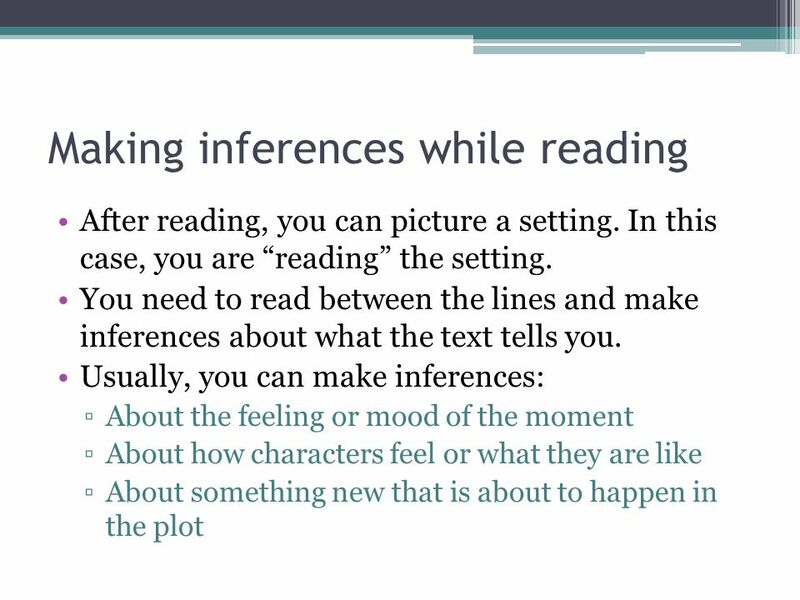 By the end of the session  Understand what inference and deduction are. 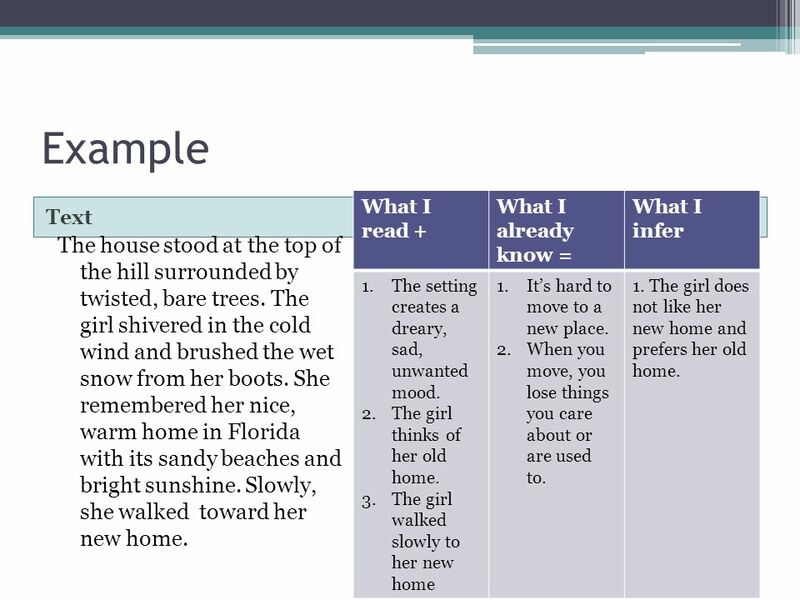  Know why inference and deduction are important skills.